This image is packed full of galaxies! 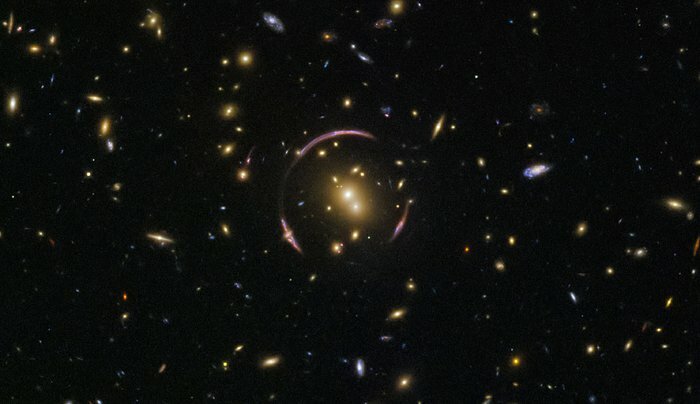 A keen eye can spot exquisite ellipticals and spectacular spirals, seen at various orientations: edge-on with the plane of the galaxy visible, face-on to show off magnificent spiral arms, and everything in between. The vast majority of these specks are galaxies, but to spot a foreground star from our own galaxy, you can look for a point of light with tell-tale diffraction spikes. 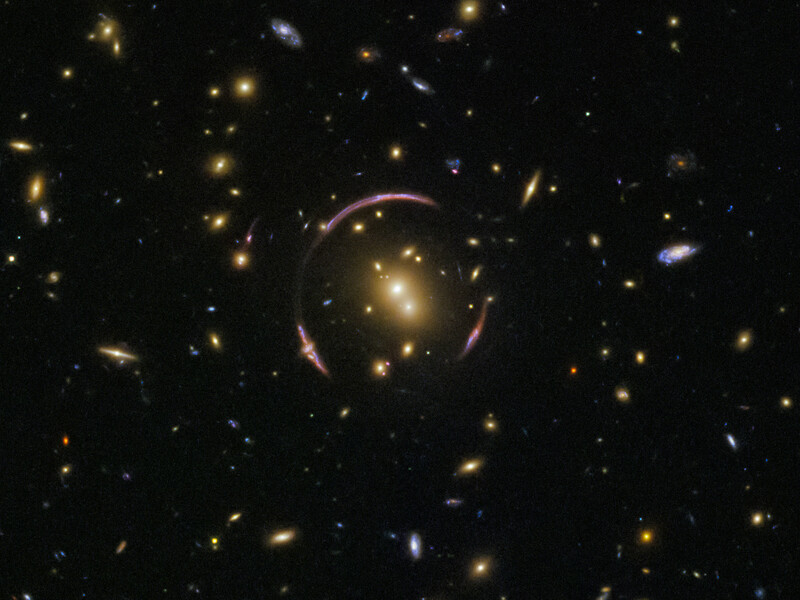 The galaxies within the image are almost all part of a galaxy cluster — a monstrous collection of hundreds of galaxies all shackled together in the unyielding grip of gravity — with the charming name of SDSSJ0146-0929. 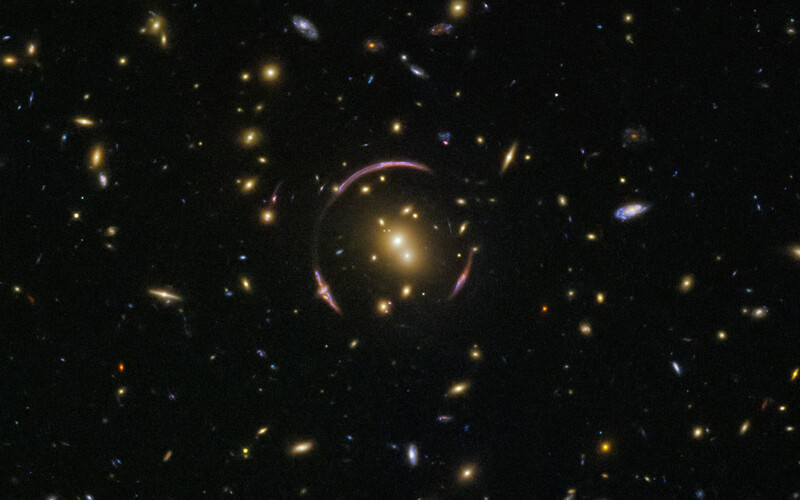 The mass of this galaxy cluster is large enough to severely distort the spacetime, creating the odd, looping curves that almost encircle the central regions of the cluster. These graceful arcs are examples of a cosmic phenomenon known as an Einstein ring. 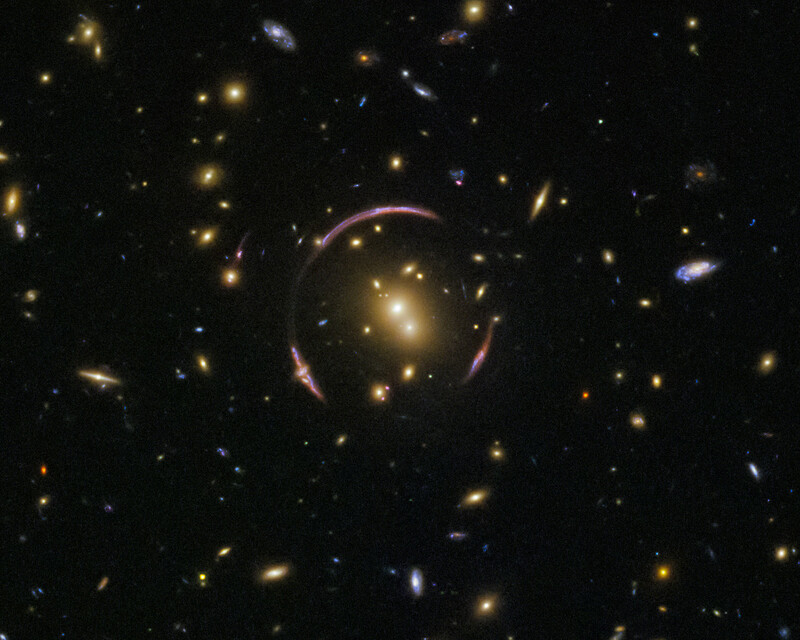 The ring is created as the light from a distant objects, like galaxies, pass by an extremely large mass, like this galaxy cluster. In this image, the light from a background galaxy is diverted and distorted around the massive intervening cluster and forced to travel along many different light paths towards Earth, making it seem as though the galaxy is in several places at once. Position (Dec): -9° 29' 51.55"